I did not know what subtitle to give this, what words could I add beside Liger and the answer is none, cause his name alone speaks volumes in the world of Japanese Puroresu and the wider world wrestling scene. Despite being the current longest tenured wrestler with New Japan, having made his debut in 1984 at the age of 19 for the company, he has also wrestled extensively for other promotions at home and abroad. 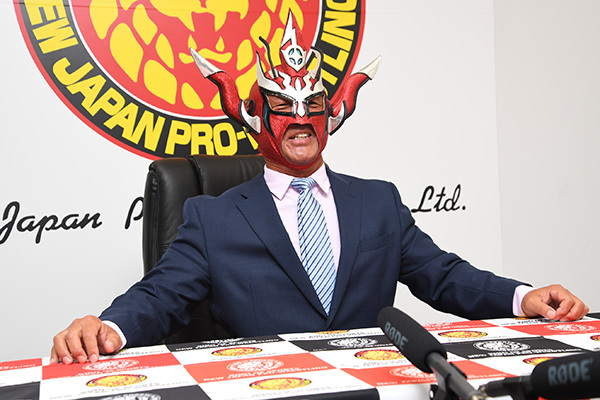 Around ten days ago, news came out following a conference by Liger, that he will retiring at the Dome in 2019. The Dome is a fitting place for Liger to bow out, as the Liger gimmick/character first debuted at the Tokyo Dome in 1989, defeating Kuniaki Kobayashi. His greatest success as a wrestler would follow, as he would go on to establish himself as the top Junior Heavyweight’s in New Japan in the 90s, dominating the IWGP Junior Heavyweight division, winning the championship 11 times, which is the record, he also holds the record for the most days as champion, on his 6th reign, he held the championship for 628 days. In total, he’s held it 11 times, defended it 31 and held it for 2,245 days. Phenomenal. He’s also won the Best of the Super Junior’s on three occasions, the Super J Cup twice. One of his greatest matches of all time, well in my very humble opinion, is the Great Sasuke match from 1994 when New Japan hosted the event. You can check it out for yourself HERE. He’s also got an impressive amount of tag team credentials too, winning the IWGP Junior Heavyweight Tag Team Championship on 6 occasions, all with different partners. But to only discuss his career in New Japan, despite how glittering with gold it is, it would do him a disservice, while his last IWGP Junior Heavyweight Championship was in 2000, most of his tag team gold would come in the 00s as well, 4 of the 6 reigns in IWGP Junior Tag would happen in this decade, with the last in 2012 with Tiger Mask. It was in this era too that he branched and and popped up elsewhere, winning titles and tournaments outside of his home promotion. In 2004, he won his sole GHC Junior Heavyweight Championship in Noah, beating Takashi Sugiura at a New Japan show in the Dome, he would go on to defend it three times in New Japan and twice in Noah before finally losing it to Yoshinobu Kanemaru at Departure 2004, also at the Dome. Another highly rated match, I believe Meltzer gave it like 4 and a half stars, back when he wasn’t handing them out for shits and giggles. You can view it HERE, He would have to wait another three years though before his next big singles title, in 2007 he won the Open the Dream Gate Championship, the main title in Dragon Gate, he would defeat Don Fuji for it at Memorial Gate before losing it to CIMA at Kobe World a few months later. I unfortunately can’t find that particular match on youtube or dailymotion but here is their encounter in the final of 2000 Super J Cup in Michinoku Pro. 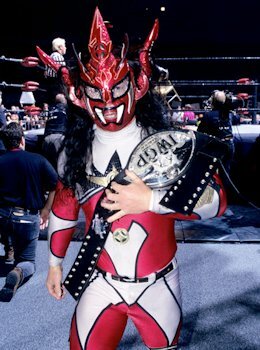 But my all time favourite Liger moment, was the arrival of Kishin Liger, an aggressive, nefarious aspect to Jushin Liger at times of severe violence sustained by opponents and as such, there has only been 3 instances when this Muta inspired Liger awoke. The first instance was when The Great Muta began using underhanded tactics in a match with Liger in 1996. There will never be another Jushin Thunder Liger, the gimmick will hopefully retire with the man under the mask, Keiichi Yamada. Any attempt to do a Liger II would just be a cheap imitation of a man who was and likely forever will be, the greatest Junior Heavyweight of all time.